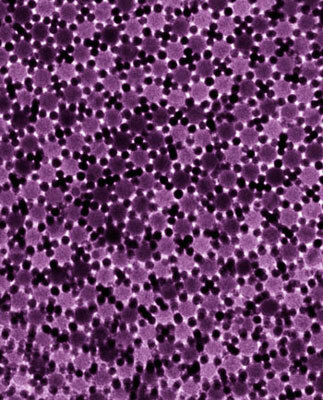 (Nanowerk News) Nanoparticles have a strong tendency to form periodic structures. Mixing and matching of two different types of nanoparticles allows the formation of binary nanoparticle superlattices isostructural to ionic or intermetallic compounds. In addition to periodic superlattices, binary mixtures of nearly spherical nanoparticles could lead to the growth of quasi-crystals. TEM showing the two-dimensional dodecagonal quasi-crystalline structure self-assembled from 5-nm Au and 13.4-nm Fe3O4 nanoparticles. CNM staff in the Nanobio Interfaces Group at Argonne National Laboratory, together with colleagues from the University of Chicago and the University of Pennsylvania, have found that two-dimensional dodecagonal quasi-crystals can be formed in mixtures of 3-nm Pd and 9-nm PbS, 5-nm Au and 13.4-nm Fe2O3, and 4.7-nm Au and 12.6-nm Fe3O4 nanoparticles ("Quasicrystalline order in self-assembled binary nanoparticle superlattices"). Studies of self-assembly of quasi-crystalline nanoparticle superstructures will provide insight into the formation of the quasi-crystalline phase in atomic systems. The assembly of the dodecagonal quasi-crystalline phase from different nanoparticle combinations shows that quasi-crystalline ordering can be a quite common phenomenon in nanocrystal solids.